The Ram was revered by the Persians and sacred to the Egyptians as a symbol of life, dominion and stability. It is also said to represent leadership and authority. The symbolism of the Ram has great antiquity. The cult of the Ram flourished in the Middle East beginning about 2000 BC. For example, the chief god of Upper Egypt was Amon, a highly spiritual deity whose name means "occult" or "hidden. "He was originally represented as having the head of a Ram and was worshiped in Roman times as Jupiter Ammon. Isaiah prophesied that the Rams returning to Israel with God's scattered children would joyfully offer themselves upon the altars of the Millennial Temple. The most famous Ram in the Old Testament is the one Abraham found trapped by its horns in a thicket on Mount Moriah where he had gone to sacrifice his only son Isaac. [Gen 22: 1-14] An angel stopped the hand of Abraham just as he was about to kill his boy and the Ram was sacrificed instead. This story is known as the akedah (binding) and is a reminder of the obedience of the patriarchs. 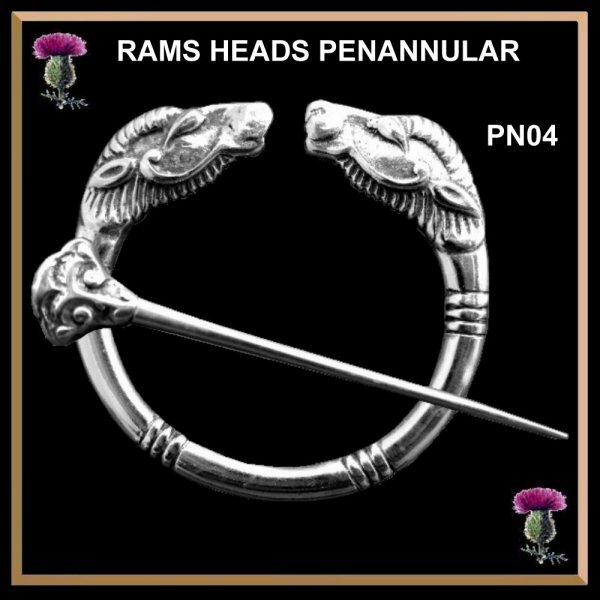 The ancient rams head zoomorphic design motif, dual rams head, is very detailed and ornate, with a solid heavy rotating penannular pin that has a matching rams face on the pin top. In Celtic symbolism, the Ram is believed to be a symbol of fecundity and rebirth. A timeless design for the millennium worn today as in centuries past. Large and heavy at 13 grams and 2"across the pin stem.